Damascus (دمشق transliteration: Dimashq, also commonly known as الشام ash-Shām) is the largest city of Syria and is also the capital. It is thought to be the oldest continuously inhabited city in the world (see: ancient history), before Al Fayyum, and Gaziantep. Its current population is estimated at about 4.5 million. 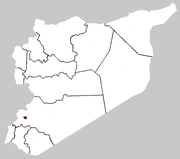 The city is a governorate by itself, and the capital of the governorate of Rif Dimashq (Rural Damascus). In Arabic, the city is called دمشق الشام Dimashq ash-Shām. Although this is often shortened to either Dimashq or ash-Shām by many, the citizens of Damascus, and of Syria and some other Arab neighbors, colloquially call the city ash-Shām. Ash-Shām is an Arabic term for north and for Syria. (Syria — particularly historical Greater Syria — is called Bilād ash-Shām — بلاد الشام, 'country of the north' — in Arabic.) It is possible that the name 'Damascus' pre-dates the Aramaic era of the city, as reflected by its Hebrew name, דמשק (Dameśeq). Damascus lies about 80 km inland from the Mediterranean Sea, sheltered by the Anti-Lebanon Mountains. It lies on a plateau 680 meters above sea-level. The old city of Damascus, enclosed by the city walls, lies on the south bank of the river Barada. To the south-east, north and north-east it is surrounded by suburban areas whose history stretches back to the Middle Ages: Midan in the south-west, Sarouja and Imara in the north and north-west. These districts originally arose on roads leading out of the city, near the tombs of religious figures. In the nineteenth century outlying villages developed on the slopes of Jabal Qasioun, overlooking the city, already the site of the Salihiyye district centred around the important shrine of Sheikh Muhi al-Din ibn Arabi. These new districts were initially settled by Kurdish soldiery and Muslim refugees from the European regions of the Ottoman Empire which had fallen under Christian rule Thus they were known as al-Akrad (the Kurds) and al-Muhajirin (the migrants). They lay two to three kilometres north of the old city. From the late nineteenth century on, a modern administrative and commercial centre began to spring up to the west of the old city, around the Barada, centred on the area known as al-merjeh or the meadow. Al-Merjeh soon became the name of what was initially the central square of modern Damascus, with the city hall on it. The courts of justice, post office and railway station stood on higher ground slightly to the south. A Europeanised residential quarter soon began to be built on the road leading between al-Merjeh and Salihiyye. The commercial and administrative centre of the new city gradually shifted northwards slightly towards this area. In the twentieth century, newer suburbs developed north of the Barada, and to some extent to the south, invading the Ghouta oasis. From 1955 the new district of Yarmouk became a second home to thousands of Palestinian refugees. City planners preferred to preserve the Ghouta as far as possible, and in the later twentieth century some of the main areas of development were to the north, in the western Mezze district and most recently along the Barada valley in Dumar in the northwest and on the slopes of the mountains at Berze in the north-east. Poorer areas, often built without official approval, have mostly developed south of the main city. 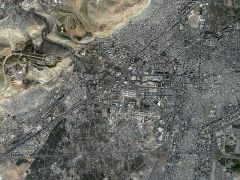 Satellite image of Damascus, with Umaween Square just above the centre. The Barada river can be seen entering the picture in the upper left corner, and the western half of the old city is in the centre of the right hand edge of the photograph. The modern district of Mezze extends north of the motorway on the centre of the left edge. Excavations at Tell Ramad on the outskirts of the city have demonstrated that Damascus has been inhabited as early as 8000 to 10,000 BC. It is due to this that Damascus is considered to be the oldest continually inhabited city in the world. However, Damascus is not documented as an important city until the coming of the Aramaeans, Semitic nomads who arrived from the Arabian peninsula. It is known that it was the Aramaeans who first established the water distribution system of Damascus by constructing canals and tunnels which maximized the efficiency of the Barada river. 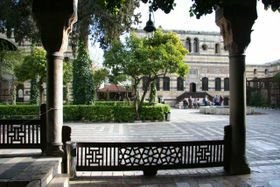 The same network was later improved by the Romans and the Umayyads, and still forms the basis of the water system of the old part of Damascus today. It was mentioned in Genesis 14 as existing at the time of the War of the Kings, although the historicity of this account has been questioned. Damascus is designated as having been part of the ancient province of Amurru in the Hyksos Kingdom, from 1720 to 1570 BC. (MacMillan, pp. 30-31). Some of the earliest Egyptian records are from the 1350 BC Amarna letters, when Damascus-(called Dimasqu) was ruled by king Biryawaza. In 1100 BC, the city became the centre of a powerful Aramaean state called Aram Damascus. The Kings of Aram Damascus were involved in many wars in the area against the Assyrians and the Israelites. One of the Kings, Ben-Hadad II, fought Shalmaneser III at the Battle of Qarqar. The ruins of the Aramean town most probably lie under the eastern part of the old walled city. After Tiglath-Pileser III captured and destroyed the city in 732 BC, it lost its independence for hundreds of years, and it fell under the Neo-Babylonian rule of Nebuchadnezzar starting in 572 BC. The Babylonian rule of the city came to an end in 538 BC when the Persians under Cyrus captured the city and made it the capital of the Persian province of Syria. Damascus first came under western control with the giant campaign of Alexander the Great that swept through the near east. After the death of Alexander in 323 BC, Damascus became the site of a struggle between the Seleucid and Ptolemaic empires. The control of the city passed frequently from one empire to the other. Seleucus Nicator, one of Alexander's generals, had made Antioch the capital of his vast empire, a decision that led Damascus' importance to decline compared with the newly founded Seleucid cities such as Latakia in the north. In 64 BC, Pompey and the Romans annexed the western part of Syria. They occupied Damascus and subsequently incorporated it into the league of ten cities known as the Decapolis because it was considered such an important centre of Greco-Roman culture. According to the New Testament, St. Paul was on the road to Damascus when he received a vision, was struck blind and as a result converted to Christianity. In the year 37, Roman Emperor Caligula transferred Damascus into Nabataean control by decree. The Nabataean king Aretas IV Philopatris ruled Damascus from his capital Petra. However, around the year 106, Nabataea was conquered by the Romans, and Damascus returned to Roman control. Damascus became a metropolis by the beginning of the second century and in 222 it was upgraded to a colonia by the Emperor Septimius Severus. With the coming of the Pax Romana, Damascus and the Roman province of Syria in general began to prosper. Damascus's importance as a caravan city was evident with the trade routes from southern Arabia, Palmyra, Petra, and the silk routes from China all converging on it. The city satisfied the Roman demands for eastern luxuries. Little remains of the architecture of the Romans, but the town planning of the old city did have a lasting effect. The Roman architects brought together the Greek and Aramaean foundations of the city and fused them into a new layout measuring approximately 1500 by 750 meters, surrounded by a city wall. The city wall contained seven gates, but only the eastern gate (Bab Sharqi) remains from the Roman period. Roman Damascus lies mostly at depths of up to five meters below the modern city. After the fall of the Umayyads and the establishment of the Abbasid caliphate in 750, Damascus was ruled from Baghdad, although in 858 al-Mutawakkil briefly established his residence there with the intention of transferring his capital there from Samarra. However, he soon abandoned the idea. As the Abbasid caliphate declined, Damascus suffered from the prevailing instability, and came under the control of local dynasties. In 875 the ruler of Egypt, Ahmad ibn Tulun, took the city, with Abbasid control being re-established only in 905. In 945 the Hamdanids took Damascus, and not long after it passed into the hands of Muhammad bin Tughj, founder of the Ikhshidid dynasty. In 968 and again in 971 the city was briefly captured by the Qaramita. In 970, the Fatimid Caliphs in Cairo gained control of Damascus. This was to usher in a turbulent period in the city's history, as the Berber troops who formed the backbone of the Fatimid forces became deeply unpopular among its citizens. The presence in Syria of the Qaramita and occasionally of Turkish military bands added to the constant pressure from the Bedouin. For a brief period from 978, Damascus was self-governing, under the leadership of a certain Qassam and protected by a citizen militia. However, the Ghouta was ravaged by the Bedouin and after a Turkish-led campaign the city once again surrendered to Fatimid rule. From 1029 to 1041 the Turkish military leader Anushtakin was governor of Damascus under the Fatimid caliph Al-Zahir, and did much to restore the city's prosperity. It appears that during this period the slow transformation of Damascus from a Graeco-Roman city layout - characterised by blocks of insulae — to a more familiar Islamic pattern took place: the grid of straight streets changed to a pattern of narrow streets, with most residents living inside harat closed off at night by heavy wooden gates to protect against criminals and the exactions of the soldiery. The statue of Saladin infront of Damascus citadel. With the arrival of the Seljuk Turks in the late 11th century, Damascus again became the capital of independent states. It was ruled by a Seljuk dynasty from 1079 to 1104, and then by another Turkish dynasty - the Burid Emirs, who withstood a siege of the city during the Second Crusade in 1148. In 1154 Damascus was conquered from the Burids by the famous Zengid Atabeg Nur ad-Din of Aleppo, the great foe of the Crusaders. He made it his capital, and following his death, it was acquired by Saladin, the ruler of Egypt, who also made it his capital. Saladin rebuilt the citadel, and it is reported that under his rule the suburbs were as extensive as the city itself. It is reported by Ibn Jubayr that during the time of Saladin, Damascus welcomed seekers of knowledge and industrious youth from around the world, who arrived for the sake of "undistracted study and seclusion" in Damascus' many colleges. In the years following Saladin's death, there were frequent conflicts between different Ayyubid sultans ruling in Damascus and Cairo. Damascus steel gained a legendary reputation among the Crusaders, and patterned steel is still "damascened". The patterned Byzantine and Chinese silks available through Damascus, one of the Western termini of the Silk Road, gave the English language "damask". In 1400 Timur, the Mongol conqueror, besieged Damascus. The Mamluk sultan dispatched a deputation from Cairo, including Ibn Khaldun, who negotiated with him, but after their withdrawal he put the city to sack. The Umayyad Mosque was burnt and men and women taken into slavery. A huge number of the city's artisans were taken to Timur's capital at Samarkand. These were the luckier citizens: many were slaughtered and their heads piled up in a field outside the north-east corner of the walls, where a city square still bears the name burj al-ruus, originally "the tower of heads". In early 1516, the Ottoman Turks, wary of the danger of an alliance between the Mamluks and the Persian Safavids, started a campaign of conquest against the Mamluk sultanate. On 21 September, the Mamluk governor of Damascus fled the city, and on 2 October the khutba in the Umayyad mosque was pronounced in the name of Selim I. The day after, the victorious sultan entered the city, staying for three months. On 15 December, he left Damascus by Bab al-Jabiya, intent on the conquest of Egypt. Little appeared to have changed in the city: one army had simply replaced another. However, on his return in October 1517, the sultan ordered the construction of a mosque, taqiyya and mausoleum at the shrine of Shaikh Muhi al-Din ibn Arabi in Salihiyya. 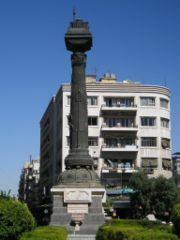 This was to be the first of Damascus' great Ottoman monuments. The Ottomans remained for the next 400 years, except for a brief occupation by Ibrahim Pasha of Egypt from 1832 to 1840. Because of its importance as the point of departure for one of the two great Hajj caravans to Mecca, Damascus was treated with more attention by the Porte than its size might have warranted — for most of this period, Aleppo was more populous and commercially more important. In 1560 the Taqiyya al-Sulaimaniyya, a mosque and khan for pilgrims on the road to Mecca, was completed to a design by the famous Ottoman architect Sinan, and soon afterwards a madrasa was built adjoining it. Perhaps the most notorious incident of these centuries was the massacre of Christians in 1860, when fighting between Druze and Maronites in Mount Lebanon spilled over into the city. Some thousands of Christians were killed, with many more being saved through the intervention of the Algerian exile Abd al-Qadir and his soldiers, who brought them to safety in Abd al-Qadir's residence and the citadel. The Christian quarter of the old city, including a number of churches, was burnt down. The Christian inhabitants of the notoriously poor and refractory Midan district outside the walls were, however, protected by their Muslim neighbours. 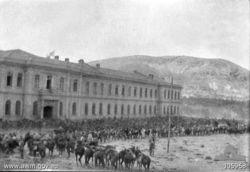 The Turkish Hospital in Damascus on 1 October 1918, shortly after the entry of the 4th Australian Light Horse Regiment. On 1 October 1918, the forces of the Arab revolt led by Nuri as-Said entered Damascus. The same day, Australian soldiers from the 4th and 10th Light Horse Regiments entered the city and accepted its surrender from the Turkish appointed Governor Emir Said (installed as Governor the previous afternoon by the retreating Turkish Commander) . A military government under Shukri Pasha was named. Other British forces including T. E. Lawrence followed later that day, and Faisal ibn Hussein was proclaimed king of Syria. Political tension rose in November 1917, when the new Bolshevik government in Russia revealed the Sykes-Picot Agreement whereby Britain and France had arranged to partition the Arab east between them. A new Franco-British proclamation on 17 November promised the "complete and definitive freeing of the peoples so long oppressed by the Turks." The Syrian Congress in March adopted a democratic constitution. However, the Versailles Conference had granted France a mandate over Syria, and in 1920 a French army crossed the Anti-Lebanon Mountains, defeated a small Syrian defensive expedition at the Battle of Maysalun and entered Damascus. The French made Damascus capital of their League of Nations Mandate of Syria. When in 1925 the Druze revolt in the Hauran spread to Damascus, the French repressed it brutally, bombing and shelling the city. The area of the old city between Souk al-Hamidiyya and Souk Midhat Pasha was burned to the ground, with many deaths, and has since then been known as al-Hariqa ("the fire"). The old city was surrounded with barbed wire to prevent rebels infiltrating from the Ghouta, and a new road was built outside the northern ramparts to facilitate the movement of armoured cars. In 1945 the French once more bombed Damascus, but on this occasion British forces intervened and the French agreed to withdraw, thus leading to the full independence of Syria in 1946. Damascus remained the capital. Damascus has a wealth of historical sites dating back to many different periods of the city's history. Since the city has been built up with every passing occupation, it has become almost impossible to excavate all the ruins of Damascus that lie up to 8 feet below the modern level. 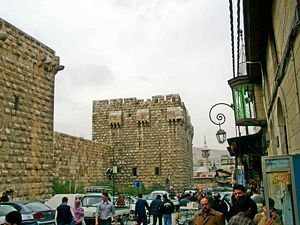 The Citadel of Damascus is located in the northwest corner of the Old City. The street called straight (referred to in the conversion of St. Paul in Acts 9:11), also known as the Via Recta, was the decumanus (East-West main street) of Roman Damascus, and extended for over 1500 meters. Today, it consists of the street of Bab Sharqi and the Souk Medhat Pasha, a covered market. The Bab Sharqi street is filled with small shops and leads to the old Christian quarter of Bab Touma (St. Thomas's Gate). Souq Medhat Pasha is also a main market in Damascus and was named after Medhat Pasha, the Ottoman governor of Damascus who renovated the Souq. 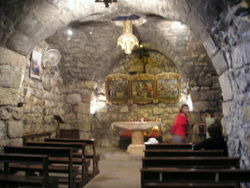 At the end of the Bab Sharqi street, one reaches the House of Ananias, an underground chapel that was the cellar of Ananias's house. A heavily visited site is the tomb of Zaynab bint Ali. Hundered of thousands of shia muslims visit it every year. al-Bab al-Saghir (the small gate) in the south. Bab al-Jabiya at the entrance to Souq Midhat Pasha, in the south-west. Two other areas outside the walled city also bear the name "gate": Bab Mousalla and Bab Sreija, both to the south-west of the walled city. Damascus is divided into many districts. Among them there are, Al-Amara, Al-Baramkah, Al-Mezzah, Al-Meedan, Al-Muhajreen, Al-Tijara and Mashrooa Dummar. Damascus is the main centre of education in Syria. It is home to Damascus University, which is the oldest and by far the largest university in Syria. After the enactment of legislation allowing private secondary institutions, several new universities were established in the city and in the surrounding area. The main airport is Damascus International Airport, approximately 20 km away from the city centre, with connections to many Asian, Europe, African, and recently, South American cities. Streets in Damascus are often narrow, mostly in the older parts of the city, and speed bumps are widely used to limit the speed. Public transport in Damascus depends extensively on minibuses. There are about one hundred lines that operate inside the city and some of them extend from the city centre to nearby suburbs. There is no schedule for the lines, and due to the limited number of official bus stops, buses will usually stop wherever a passenger needs to get on or off. The number of buses serving the same line is relatively high, which minimizes the waiting time. Lines are not numbered, rather they are given captions mostly indicating the two end points and possibly an important station along the line. Al-Hijaz railway station, lies in the city centre. Currently this station is closed, and railway connections wih other cities take palce in suburb. The majority of the population in Damascus came as a result of rural-urban migration. 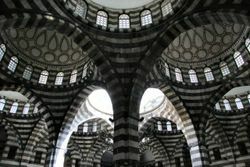 It is believed that the local people of Damascus, called Damascene, are about 1.5 million. 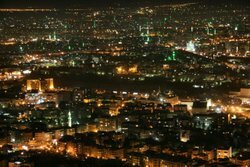 Damascus is considered by most people to be a very safe city. Haggling is common, especially in the traditional souks. Corruption is widespread, but in the past few years there have been aims at combating it, by both the government and non-governmental organizations. Tea is arguably the favourite beverage in Damascus. The majority of Damascenes - about 75 % - are Sunni Muslims. 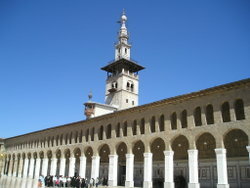 It is believed that there are more than one thousand mosques in Damascus, the most famous one being the Umayyad Mosque. There are some Christian districts, such as Bab Touma, with many churches, most notably the ancient St. Paul's Church. Tishreen Park is by far the largest park in Damascus. It is home to the yearly held Damascus Flower Show. Other parks include Aljahiz, Altijara and Alwahda. Damascus oasis is also a popular destination for recreation. Cafes are popular meeting spots for Damascene, where Arghilehs (water pipes) and popular beverages are served. Card games, Tables (backgammon variants), and chess are common in these cafes. In Damascus there are two districts with the names Al-Hareeqa and Al-Itfa'iyya, the first meaning "the fire" and the second meaning "the fire station"